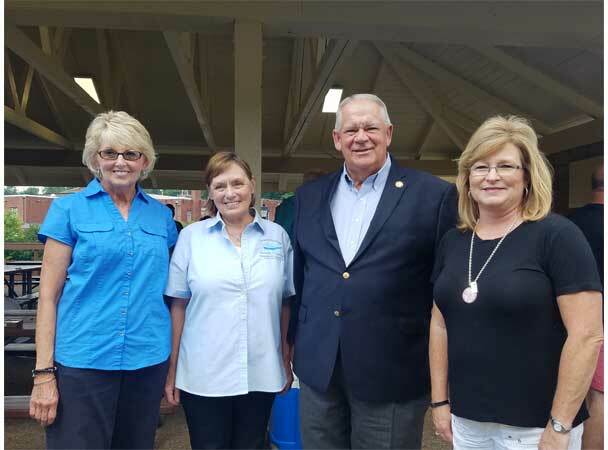 McCaysville, GA – Speaker David Ralston (R-Blue Ridge) addressed a large gathering on Tuesday, July 18, at 3:30 p.m. at McCaysville City Park. The topic was Fannin County priorities included in the Fiscal Year 2018 State Budget. Ralston said he is excited about everything going on in McCaysville adding, “Hwy 5 is heading more and more to becoming a reality” this has been a project which has been discussed since the ’80’s. He continued explaining how every year they go through in the session of the general assembly a budget process. They appropriate about 25 billion dollars from the budget based on the revenues they take in and then allocate. Sixty-two percent of our State Budget goes to education. Ralston explained how they balanced the budget without raising taxes and pointed out there are 5 to 6 states who cannot do this. Georgia is now one of only 8 states in the Nation who have a Triple A bond rating. What this means for Georgia is if it has to incur bonded indebtedness it can be done with little to no interest. The specific items in this year budget which directly impact McCaysville and Fannin County were $500,000 allocation for a new street and park enhancement project for the City of McCaysville. This will include work for drainage, trail work, and work to enhance the park. There was $75,000 designated for a Young Farmer Program at Fannin County High School. The final item Ralston discussed was regarding a message he received late in the session when he was home one evening. He received a text about a big brush fire which occurred between McCaysville and Mineral Bluff and they had to wait 3 to 4 hours to get a unit from the Georgia Forestry Commission to help put it out and it was getting bigger by the minute. Ralston said he had found out over the years the assets at the Georgia Forestry Commission location in Fannin County had been diverted to other places. He told the crowd, “I went in on Monday morning and I said we got to fix that and we did and here’s what’s going to happen. We are going to utilize primarily existing funds to expand the Fannin County District Office Georgia Forestry Commission and renovate that office. We are gong to have an additional transport and tractor unit, 2 new units have been relocated to Fannin County. Hiring a new ranger position which will bring staffing levels to a Chief Ranger Supervisor and 3 rangers for improved response time and oversight to protect property owners and the forest here in our community. Ralston said these things were important and he wanted to come and share the information with the community. He expressed his appreciation for the cooperation from the City, the School System, the Fannin County Chamber of Commerce and of course the law enforcement.